So, what exactly is the Prismatic Coefficient (or Block Coefficient as it's also known) and why do sailboat designers get so involved with it? 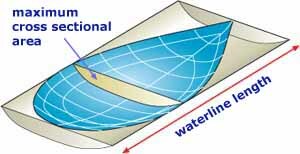 Well, hull drag and wave-making resistance isn't only a function of length and surface area; the shapes of the immersed fore and aft hull sections have an influence upon it too. What is actually crucial is the rate of change of the cross-sectional areas of the hull. A boat whose hull changes slowly will slip through the water easier and generate less wavemaking resistance than a hull with a rapid rate of change. This is where the prismatic coefficient comes in; it's a measure of how quickly the cross-sectional area changes, or in sailing parlance, of how full or fine the ends are. A is the maximum cross-sectional area in square feet. L is the waterline length in feet. The Cp thus indicates the longitudinal distribution of the underwater volume of a yacht's hull. A low (fine) Cp indicates a hull with fine ends. A large (full) Cp indicates a hull with relatively full ends. So for a displacement boat sailing at its maximum Speed/Length Ratio of 1.34, the optimum Cp is 0.63. But in light conditions most boats won't achieve anything like their hull speed, and so would be punished in these conditions by a Cp optimized for hull speed. And herein lays the designer's dilemma, as his creation will sometimes be nudging along gently in light airs and at others blasting along at hull speed or beyond. Knowledge of the predominating conditions in the area that the boat is to be sailed will help him select the Cp. It's something of a black art, based on technical knowledge and empirical guesswork - and having made his decision, he's likely to keep it very close to his chest.